On the second half of our trip in autumn 2015 we rode the KiwiExperience bus from Wellington to Auckland. After a rocky sail through the Cook Straight we arrived in Wellington by 11am. We spent a few hours perusing Te Papa’s impressive temporary exhibitions. The next day we began the drive north to Auckland. Our familiarity with the North Island was useful and we hopped off the bus at some favorite spots, like Turangi for fly fishing. In Taupo we visited Huka Falls and the nearby Thermal Spa. It was crowded with a party atmosphere. In Rotorua we stopped to admire the largest pool of bubbling mud, Wai-o-tapu. 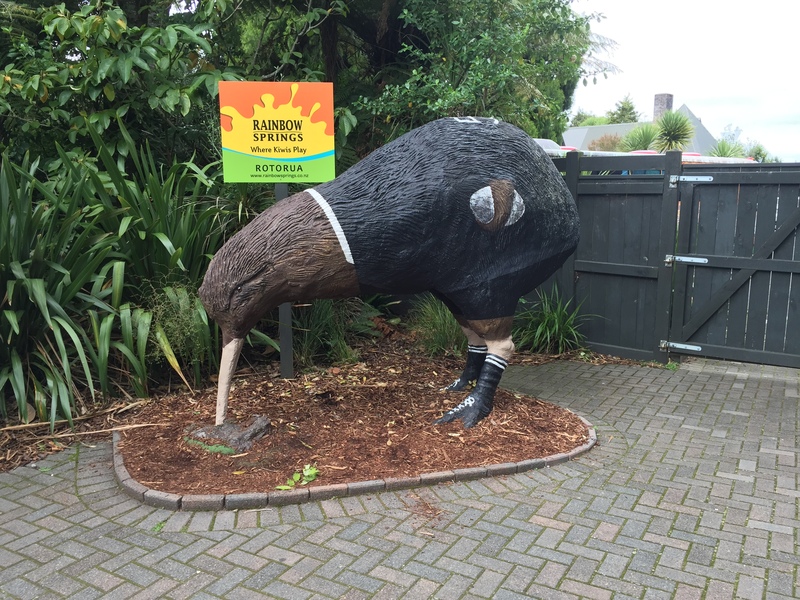 Next was an educational kiwi tour at Rainbow Springs. We learned about conservation efforts and saw active kiwis of all ages. This place is great! Then we made a direct drive back to Auckland and somehow managed to avoid weekend traffic returning to the city. Rode the Interisland Ferry from Picton; rough seas in the Cook Straight, don’t need to do that again. Enjoyed Air New Zealand’s 75th Birthday exhibition and Gallipoli exhibit at Te Papa. Craft beer tastings at Black Dog, Malthouse (!! ), and Hashigo Zake (had Virginia beer on tap). Attended Cori Gonzalez-Macuer’s Comedy Festival show. Ate po boys at Sweet Mother and late night street pizza was good until Allen compared it to pizzamart. Slept in a dorm at YHA Wellington. Lunch stop in Taihape, gumboot capital of the world. The sun is shining in Turangi so I read outside while Allen fished. Disappointing coffee at Cadillac Cafe. Wish I had held out until we got lunch at new spot Hydro. Stayed in dorm at Extreme Backpackers. Stunning views of Ruapehu and Mount Doom as we approached town. Visited Huka Falls and Spa Thermal Park. Dined at Indian Affair and got pies for the road at Fast & Fresh Bakery Cafe (!!). Had an 8-person dorm to ourselves at YHA Taupo. Stopped at Wai-o-tapu, Rotorua’s largest pool of bubbling mud. Learned about Kiwi conservation and saw several of them at Rainbow Springs!